At Cap and Kudler, we provide personal injury representation with a personal touch. Our attorneys have a long-standing reputation for success in representing people who were injured by someone else’s negligence, carelessness or wrongful conduct. Our experienced attorneys personally manage each case, ensuring that the value of the claim is fully assessed, identifying all of the potentially responsible parties and negotiating with insurance companies and other at-fault parties to obtain full compensation for our clients. We have the skill and experience to pursue a full and fair recovery for each client, through negotiation, mediation, arbitration, the short trial process or conventional litigation, as appropriate. We have the resources and experience to handle all aspects of each case, including assisting in coordination of insurance benefits, Medical Payments and Personal Injury Protection coverage issues, liens, obtaining a rental car and other issues. We know that the legal process can be lengthy, time consuming and frustrating. We will be here for you and will work with you to get the best result possible. Straight answers, personal attention and exceptional results. 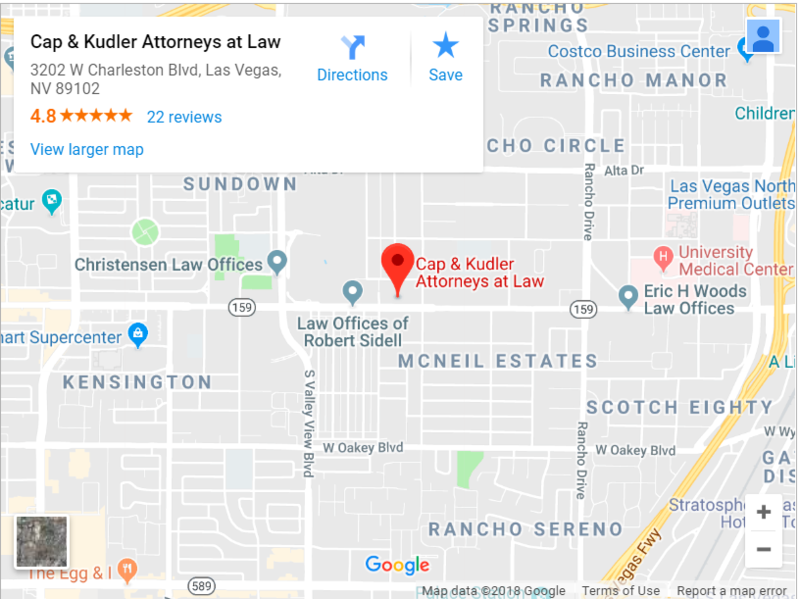 Choose the Las Vegas personal injury law firm of Cap and Kudler to protect your rights. Call us today at (866) 412-7166 or submit an online form to schedule your free consultation.